Dianella revoluta, commonly known as blueberry lily, blue flax-lily, black anther flax-lily or spreading flax-lily is widely distributed within Australia and grows in extremely variable conditions, predominantly in sclerophyll, woodland and mallee forests. Dianella revoluta is sometimes a dominant understorey species and can form large spreading colonies in the wild. Dianella is derived from Diana, the Roman goddess of the hunt who was often associated with woodlands. The suffix ‘ella’ means small. The first specimen was collected from the island of Mauritius and was simply labeled ‘Diana’ by French botanist-explorer Philibert Commerson. Revoluta comes from ‘revolute’, referring to the leaves' in-rolled margins. We got this selection, 'Sea Breeze,' from Australian Native Plants in the Ojai valley in southern California. D. revoluta is an erect, hairless, perennial herb with a lifespan of many years, forming clumps and growing from rhizomes underground. D. revoluta grows to about 1m in height and has a diameter of up to 1.5m. The leaves are leathery, long and linear, varying in length from 1.5 – 8.5 cm and width from 4 – 15mm. This species flowers from spring to summer and has deep blue to purple inflorescences. The flowers stalks rise on wiry stems from the foliage, frequently exceeding it in height. The racemes are terminal panicles measuring up to 1.7m, branching several times into open sprays with one flower a day opening. This prolongs the flowering time for long periods. Flowers have six tepals, reflexed measuring 7-12mm in length and six stamens which are projected in a ring around the superior ovary. Filaments are long thick and yellow and anthers are brown to black in colour. The fruit are blue to purple and persist for many months after the flowers. Usually round in shape they measure from 4-10mm in diameter and contain 3-4 seeds. This plant is horticulturally desirable because once it is established it is very hardy and has a wide moisture and temperature range excluding inland extremes. It is drought and frost resistant, is generally trouble-free and is grown for its distinctive strappy foliage as well as for its flowers and fruits. D. revoluta provides long periods of interest in gardens looking decorative with its compact, clumping and evergreen foliage. It is suitable for most soils, but prefers a well drained soil enriched with leaf mould and compost, and accepts part or full shade. It looks best in mass planting and makes a lovely understorey plant while adding texture. 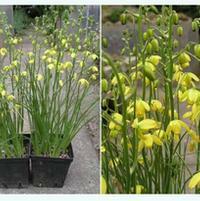 It is suitable for most rockeries and can be grown as a border or just adding quality to the bushland garden. Birds including parrots are also attracted by the fruit. Propagation can be either from the ripe seed collected by hand and sown in spring or by the division of rhizomes which can be struck in moist shady conditions in light soil during cooler months in later winter. When young it is advisable to water plentifully. This plant's virtually maintenance-free! Occasionally, there'll be a dead leaf that you can either pull away from the main clump of foliage or cut it off at ground level. Spent flower stems should be cut off at ground level, or as close to the ground as you can get.